Linda Collins | Greene County News Dana Storts, manager of the Greene County Environmental Services, gave a presentation about the recycling programs and services available to county residents and businesses during the Nov. 7 Bath Township regular meeting. BATH TOWNSHIP — Dana Storts, manager of the Greene County Environmental Services, paid a visit to the Bath Township Trustees’ meeting Nov. 7 to speak about the types of recycling programs and services available to county residents and businesses. According to Storts, the Greene County Solid Waste District has seen leaps forwards in recycling across the county and has successfully complied with Goal 2 of the Ohio Solid Waste Plan. The district is required to maintain at least 25 percent waste reduction for the residential and commercial sectors and 50 percent waste reduction for the industrial sector. Storts also noted that the county drop-off recycling facility, 2145 Greene Way Blvd. in Xenia, would continue to maintain convenient operating hours during the winter months. Township residents will have the opportunity to drop off glass bottles and jars, metal cans, corrugated cardboard, plastic bottles and jugs, paper products, including newspapers, from 7:30 a.m. to 6 p.m. Monday through Thursday; 7:30 a.m. to 4:30 p.m. on Friday; and 9 a.m. to 4 p.m. Saturdays. The facility is closed on Sundays and major holidays. The county environmental services offers free recycling of yard waste as well. Township residents are encouraged to drop off leaves, brush, grass clippings, and other yard waste from 10:30 a.m. to 6 p.m. Monday through Thursday and from 9 a.m. to 4 p.m. on Saturday at the drop-off recycling facility. All brush should not exceed 4 inches in diameter and 8 feet in length. The maximum size for firewood is 14 inches in diameter and 15 inches in length. Storts noted that these services are not available on Fridays, Sundays, or major holidays. Environmental services will also be holding special drop-off events for hazardous household waste from 12:30 p.m. to 2:30 p.m. on Nov. 27 and Dec. 18 at the recycling drop-off facility. Acceptable hazardous waste items include acids, cleaners, aerosol spray cans, antifreeze, herbicides, fertilizers, insecticides, pesticides, putty, adhesives, up to five gallons of gasoline and kerosene, stains, varnishes, paint thinner, tube-type fluorescent light bulbs and paint. The drop-off facility will also accept window air conditioners, large household appliances with or without Freon, scrap metal, furnaces and heaters, gas and charcoal grills, steel sinks and bathtubs, fencing, metal pipes, aluminum, dehumidifiers and microwave ovens during the special events. However, items, such as motor oil, electronics, small household appliances, computers, monitors, printers, televisions, compact fluorescent and incandescent bulbs, pharmaceuticals, ammunition, and explosives, will not be accepted. For more information about recycling and a tire drop-off event scheduled for March 2019, call 937-562-5925 or visit www.co.greene.oh.us/199/Environmental-Services. 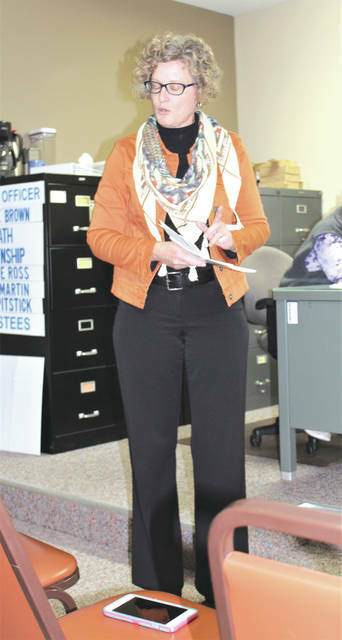 https://www.fairborndailyherald.com/wp-content/uploads/sites/50/2018/11/web1_IMG_4380.jpgLinda Collins | Greene County News Dana Storts, manager of the Greene County Environmental Services, gave a presentation about the recycling programs and services available to county residents and businesses during the Nov. 7 Bath Township regular meeting.